Chevy’s popular Impala was one of America's top 10 vehicles in sales during the 2006 model year and continued to attract more customers through'07 – including a nearly 44-percent jump in February'07 alone. Indeed, the Impala’s combination of chiseled style, generous room, sporty driving characteristics and value answers the needs of a broad range of drivers. The 2008 Impala reinforces the brand’s value story with new features and revisions that add to its safety and efficiency, including the addition of standard StabiliTrak electronic stability control on 2LT, LTZ and SS models; and the addition of E85 FlexFuel capability to the 3.9L V-6 engine – an engine that also is equipped with the fuel-saving Active Fuel Management feature. The 5.3L V-8 of the Impala SS comes with standard Active Fuel Management. Active Fuel Management is a fuel-saving technology that shuts off half the engine’s cylinders when full power is not needed. It can improve fuel economy by up to 12 percent in certain driving situations. Impala’s standard and available safety features include ABS, traction control and side-curtain roof rail air bags. StabiliTrak electronic stability control is new for'08 and is standard on 2LT, LTZ and SS models. There is also a new 1LT Luxury Edition package, which features a leather-trimmed interior – including a leather-wrapped steering wheel with radio controls – flip-and-fold rear seat, four-wheel ABS with electronic traction control, rear spoiler, OnStar with Turn-By-Turn Navigation and one-year Directions & Connections service. This package offers popular features and the industry’s easiest-to-use navigation system at a discounted price. Chevy Impala conveys sophistication and exudes big-car roominess. On the exterior, large headlamps have a premium, jeweled appearance with three independent lighting units. These details complement other high-quality attributes, such as tight tolerances of 3.5 mm or less between body components and substantial “grab”-style door handles, to provide an overall feeling of solidity. Also, new, flat-blade windshield wipers are used to provide consistent pressure on the glass, which helps eliminate streaking and wind noise. The Impala LS, LT and LTZ models have varied exterior trim cues that identify each model, while the Impala SS receives a distinct front-end appearance. It includes a dual-split grille with a SS-signature black-diamond crosshatch pattern. At the rear, a spoiler is standard on LTZ and SS models and is available on LT. The Impala SS also receives Corvette-inspired bright exhaust tips. Inside, Impala is packed with thoughtful features, including clever flip-and-fold rear seats (standard on LTZ and SS, available on LT). The forward-flip rear seat cushions reveal a storage tub under the seat that can contain spillage while transporting a variety of items. The tub also serves as a covered storage area beneath the seat with cushions down and offer convenient grocery bag hooks when the cushions are flipped forward. A generous pass-through from the trunk can be created by flipping the seat bottoms forward and the seat backs flat – an exclusive feature in the midsize segment. 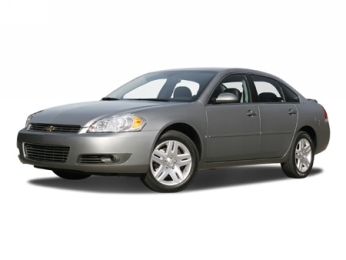 All of Impala’s available seating features cleaner, simpler and more tailored appearances. Uplevel Nuance leather- appointed seating features premium deck seams around their perimeter and French seams on the center cushions. The seats also have firmer cushions and increased lumbar support that provide more comfort, especially during long drives. The driver’s seat also includes adjustable lumbar. The Impala’s instrument panel wraps around into the door panels and has a double-hump design that is reminiscent of early Corvettes. Impala LS, LT and LTZ models have a wood-trimmed appearance, while a sportier, brushed sterling-appearance trim is available. The Impala SS comes standard with a “technical”-pattern trim panel, with the wood-trimmed appearance as an option. New 7.0 Generation OnStar system offers Turn-by-Turn navigation. Three audio systems feature simple-to-operate radios that include standard XM Satellite Radio and are compatible with the enhanced OnStar system. The base MP3/CD radio includes a six-speaker system, a two-line, 32-character reconfigurable display and the capability to select between AM, FM and XM stations without having to reset the frequency. An uplevel ICDX radio adds an in-dash six-CD changer. Impala also offers a premium Bose audio system. All radios include a standard auxiliary input jack for external devices such as an iPod or remote cassette player. Located in the lower right-hand corner of each radio, the input allows for plug-and-play through Impala’s sound system. Quiet, smoothness and refinement are the ride and handling traits conveyed through the Impala’s chassis and suspension systems. A robust front-end structure provides a firmer foundation to help reduce noise, vibration and harshness (NVH), while also enhancing steering and handling performance. Impala’s fully boxed upper frame rail assemblies have a wider, deeper and structurally stronger upper front tie bar. Stronger ties between the upper and lower rails stiffen the front structure for improved ride and handling and a large, lower front-of-dash panel has been strengthened. It is constructed of Quiet Steel laminated steel, which consists of sound deadening material bonded between sheets of steel and reduces resonant sound. An extruded aluminum engine cradle is used on both vehicles, too, and contributes to a smoother, vibration-free ride. The cradle’s lateral stiffness (at the steering joint) is increased with a new, one-piece machined rear cross member and new aluminum rear body mounts to help improve handling control. Models equipped with a V-6 engine have a two-point engine-mounting system, while V-8 models have a three-point mounting system. A power rack-and-pinion steering system is standard on all models, with a responsive 13.3:1 steering ratio on LT, LTZ and SS models. All models feature a quiet, efficient power steering system that optimizes internal flow of the hydraulic steering fluid within the pump and reservoirs. FE1 (LS and LT): The FE1 suspension provides great control without compromising ride quality. It uses stiff, constant-rate front springs and variable-rate rear springs to provide higher roll rates and, at the front, a stiffer torque strut design reduces NVH and helps provide a smoother, quieter ride. The packages include 16-inch wheels and P225/60R16 ALS (all-season) Goodyear Integrity radials; on LT models equipped with the 3.9L V-6, it includes 17-inch wheels and P225/55R17 AL2 (touring) Goodyear Eagle LS2 radials. FE3 ( LTZ and SS): Impala LTZ and SS models receive a FE3 suspension, which includes 18-inch W-rated P235/50R18 AL3 (performance) tires and five-spoke alloy wheels, to provide a sporty ride that complements the 5.3L small-block V-8’s performance. A 34-mm hollow front stabilizer bar and 18-mm solid rear stabilizer bar combine to provide more roll control than the FE1 or FE2 suspensions. Also, increased stiffness helps reduce body lean and contributes to greater high-speed stability. Impala’s V-6 engines are as fuel-efficient as they are sophisticated. A 3.5L V-6 is standard in the Impala LS and LT, delivering 211 horsepower (157 kW)* and 214 lb.-ft. (290 Nm)* of torque – more standard power as a base engine than some key competitors’ top (or only) offering. Vehicles with federal emissions systems in the United States are equipped with the 3.5L engine, which is compatible with E85 ethanol fuel, allowing the vehicle to run on any combination of gasoline and/or E85. Vehicles sold in YF5 ( California ) or NE1 (Northeast) emissions are equipped with PZEV versions of the 3.5L engine. This engine is not E85-compatible. Customers in these areas have the option of ordering E85-compatible engines. Standard in LTZ and available in LT models is the 3.9L V-6 that features E85 FlexFuel capability and Active Fuel Management. The 3.9L uses variable valve timing and a variable-length intake manifold to help produce 233 horsepower (174 kW)* and 240 lb.-ft. (325 Nm) of torque. * This engine offers more power and usable torque within its operating range, with 90 percent of peak torque available from 1800 to 5800 rpm. 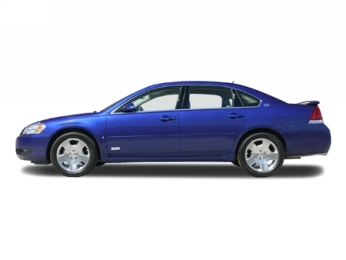 The 5.3L all-aluminum small-block V-8 powers the performance-oriented Impala SS. It features Active Fuel Management, which can provide up to 8 percent better fuel economy. Developed exclusively for front-drive applications, the SS’s 5.3L engine produces 303 horsepower (226 kW)* and 323 lb.-ft. (438 Nm)* of torque. All of Impala’s engines are matched with the Hydra-Matic 4T65 electronically controlled four-speed automatic transmission, which is renowned for its smoothness and durability. A strengthened version is equipped with the 5.3L engine to handle the V-8’s torque. Standard remote keyless entry (RKE) system provides a second function for the red panic button. Drivers can use the button to locate their cars, without sounding the panic alarm. The Impala includes features designed to enhance the vehicle structure, including lighter, more rigid front and rear bumper systems. Also, the Impala features a strengthened “safety cage” passenger compartment with the front and rear doors designed for improved energy dissipation in the event of a crash. The OnStar system is standard on Impala. Its digital hardware includes upgraded hands-free voice recognition capabilities, including more intuitive continuous digit dialing and improved voice recognition accuracy. OnStar is the leading provider of in-vehicle safety, security and information services in the United States and Canada . Using the GPS satellite network and wireless technology, OnStar features core safety services and OnStar Personal Calling that allows drivers to make and receive hands-free, voice-activated phone calls using a powerful 3-watt digital/analog system and external antenna for greater reception. The OnStar service available on the 2008 Impala includes the General Motors Advanced Automatic Crash Notification (AACN) system, making crash data available to 911 centers to potentially dispatch the appropriate life-saving personnel and equipment to crash scenes faster. The 7.0 Generation OnStar system offers Turn-by-Turn navigation with the optional Directions and Connections service. Turn-by-Turn navigation directs the driver through the route by using the digital readout lines in the radio head. Directions are downloaded by the OnStar advisor to the vehicle and can be played back or paused through the drive up to the destination. Besides being an easy to use system (all directions are downloaded to the car by an advisor) Turn-by-Turn offers an affordable system that is always up to date (no need to purchase map updates).